Material: 24k Gold Filled. Quantity: One Bracelet. Clasp: Hinged Tension Closure. Width: 8mm GREAT WIDTH! Hallmark: 足金 the gold content 999‰. Length: 16 cm=6.3"L. We will do our best to give you the most wonderful experience. We believe everything can be solved by open communication. We will fix the problem well until you are satisfied. Size: 3D pixiu 19 9 8 mm, smoky quartz bead 10 mm. Main stone: Smoky Quartz. Hallmark: 千足金 the gold content 999‰. Weight: gold approx. 1 g ( may have a 0.2 g difference). ( the color may be more dark than the pictures show ). Size:Pig 8 6mm. Hallmark: 足金 the gold content 999‰. Craft: Classic design, and good craft. Weight: Within 1g. It's really rare in China that people could do it perfectly well at minimum price. • Style: baby Bracelet/ Bangle. • weight: 7.5 grams. KTS Jewelry. You can be certain that we will do everything we can to make sure your item arrives quickly. This lovely piece has an S link clasp, unique to the 24 karat pieces. The bracelet has a curb link separated by a bar. The bracelet is accented by a ball charm. The bracelet is 6.5”. A lovely piece. Size: 3D pixiu 14 6 6 mm, bead 3 mm. Length: adjustable, 16 cm=6.3"L. #2, Neutral. Weight: less than 1.2 g. I am scared to see low DSR rate or Neutral. It is 7” long and weighs 7.4 grams. 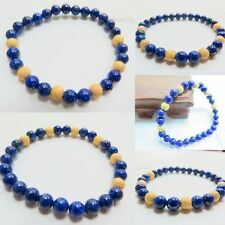 This bracelet is in very good pre-owned condition. Size: 3D pixiu 14 6 6 mm, bead 3 mm. Length: adjustable, 16 cm=6.3"L. Weight: less than 2.4 g.
Size: pixiu 19.7 9.8 8 mm, agate bead 10 mm. Hallmark: 千足金 the gold content 999‰. We will do our best to give you the most wonderful experience. We believe everything can be solved by open communication. •Type: bracelet. • Weight: 6 grams. You can be certain that we will do everything we can to make sure your item arrives quickly. •Free: Box & Pouch (included). Diamond Cut ( shiny). Total Weight: 14.16 grams. Made in USA. Hair rope/string. loose beads. unisex ring. hand piece. Size: Adjustable. jewelry box. Item Details. health&beauty. 24K Yellow Gold ID Bracelet 14.8 Grams - 5"
• Weight: 14.8 grams. You can be certain that we will do everything we can to make sure your item arrives quickly. • Closure type: S Clasp. • Width: 8.93 mm. Craft: Classic Craft. Wear the right length. A necklace that falls just below the collarbone goes better with a plunging neckline than a high one. A necklace that falls below the bust goes with a high neckline. Length: 16". Marking: GURHAN ND422. 990. When use the 24k loop clasp, just gently twist it up or down to open. And gently twist it back to close. Don't pull the loop wide to open. 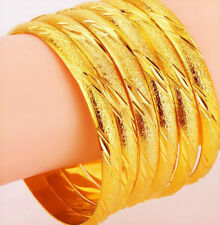 This is a stunning handmade Chinese bangle bracelet made of 24k yellow gold. Marked. 999 with the maker's hallmarks on the inside. About 7.75" and 17 mm wide. Has a few small dings from normal wear due to 24k being fairly soft naturally. 24k Yellow Gold Baby ID Bracelet 5.7 Grams- 5"
• Weight: 5.7 grams. You can be certain that we will do everything we can to make sure your item arrives quickly. 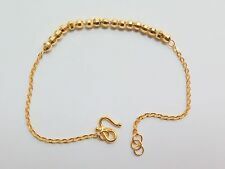 This is a beautiful gold bracelet, it is crafted from solid 24k gold with a fine polished finish and features a fancy open curb chain link with a floral motif stick and screw clasp with chain attached for added security. Total Weight: 8.65 grams. Made in USA. Gold Karat : 24k. Weight : 16.55 grams. Solid Gold (not plated). Bracelet is marked. 9999, weighs 5.7 grams and is adjustable in length (5" largest and adjusts downward). 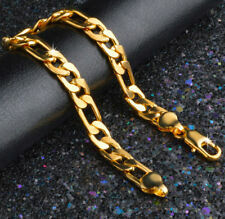 Open loop chain is 4mm in width and each of the 3 charms is about 8 x 6mm. Notes: This beautiful, cool and unique tropical pineapple fruit bracelet is just so much beauty and fun! The bracelet is expertly crafted out of pure 24k gold while the clasp and clasp settings are made of 18k gold (because 24k is too soft for strong sturdy clasp). 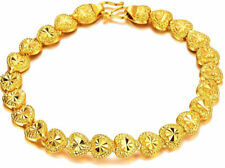 24k 999.9 Solid Yellow gold handmade Box baht bracelet. Gold : 24k 999.9. Weight : 50.00 grams. All gold are 100% genuine. Not plated. 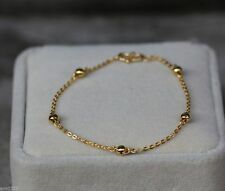 2 4K SOLID GOLD THAI BAHT BRACELET. WEIGHS 14.6 GRAMS of 24K SOLID GOLD. BOX BRACELET with a 10.4 mm ball charm. All of our diamonds are real and none of our gold is plated (unless otherwise noted). Total Gold Weight: 3.55 grams. 24k Yellow Gold Three Bars Baby Bracelet 6.3 Grams- 5"
• type: baby bracelet. • Weight: 6.3 grams. You can be certain that we will do everything we can to make sure your item arrives quickly. Total Weight: 10.61 grams. Made in USA. Yes On latch hook are makers symbols and 9999. 5mm chain links. Inventory Number. Approximate carat total weight of all stones. For your consideration is a collectible Hello Kitty bracelet. It features an ‘S’ clasp that is stamped. 9999 purity. It is a highly detailed piece with a frosted finish and has been previously owned. Weigh 15.6 grams! it is hallmarked as 9999 and tested as such. Up for sale is a Korean "Dol Palji" made of. 999 pure fine gold. The characters on the bracelet usually signifies wealth, good fortune, and hope for prosperous life. Below is a background of the dol tradition.